My oldest daughter has been asking me for a housecoat for over a year now! I have a big white fluffy one that she has seen me wear, and she has wanted one just like it for her. So, naturally, both of my hands went up when I saw the testing call for the Arctic Fox Housecoat by Sofiona Designs. After I finished her housecoat, I even made her a new set of pajamas to go with it out of the Starry Night PJ Set from Sofiona. I am reviewing both patterns today for this post and talking about the new PDF sewing pattern company Sofiona Designs. The Arctic Fox has a hood, comes in 2 lengths, has patch pockets, and is finished with bias details on the facing and hood seams. The housecoat has a hook at the back to hang it and a belt with belt loops to keep it tied. The housecoat is very straightforward to sew and uses thick plush fabrics. Everything matched up perfectly, and the pattern has just the right amount of ease to fit comfortably and give room for growth. I hate it when my kids' grow out of something in 2 weeks! I think that Sofiona did a great job with the pattern! I used the Sew Lush Fleece fabric from Joann, and it is so soft and furry. This was my first time sewing with Sew Lush fleece. Sew Lush fabric is a cross between minky and fur. You will find it everywhere and need to clean your entire sewing room when you finish. It is the first fabric that ever made me cry. No joke. I was finishing the facing at midnight and trying to keep it from shifting and holding my binding down. I just wanted it to cooperate! If you are a beginner, I would recommend using antipill fleece or something more stable first. Ripping stitches on Sew Lush felt impossible, and you are not going to iron it to steam out mistakes. I think this fabric was really humbling to me as a seamstress, and I wasn't entirely happy with how mine looked in the end. This sweet little girl didn't care, though, and squealed with delight when she saw her finished robe. She has since been wearing it every night and has repeatedly told me how excited she is that I finally made it for her! The pocket cleverly is lined with quilting cotton. It is such a sweet touch! I made my own bias tape for this project. If you are in a hurry or don't want to make your own bias tape, you could just serge the facing and neckline seams and topstitch them down. I did not test the Starry Night PJs but wanted to make one for my daughter to go with her robe. The PJ set comes with a nightgown option (short or long length) and a top and pants option. It has an optional ruffle between the bodice and skirt part of the top/dress. The bodice is lined and the rest of the armscye and the neckline is finished with binding. I absolutely loved how nice everything laid on this top! I have a similar top that is finished with bands, and the crisp point on the back never has laid right with bands. I think the lined bodice + binding finishings makes everything lay perfectly. She has already asked whether she can wear her top during the day too! I know that during the summer I will be making some of the tops for my daughters to wear as tanks. I love the gathering in the front and back on this top! It is so cute. She has worn this set so much since I have made it! I used cotton lycra for everything on the PJ set. The print came from Fabrictopia in Dallas, and the solid is from Made Whimsy. The pants have elastic in the waist that is turned under to conceal it. They were very quick and easy to make. They remind me of my favorite store-bought pj pants with just the right amount of ease for comfort. I tried the suggested elastic on her waist, and I added 1.5 inches to it to make it more comfortable for her. Sofiona is a new pattern company that was started by Trisha Yanke and Sherri Herrera, two Canadian best friends who will be starting by offering girls patterns in the 2-14 size range. I hope that they venture into designing women's patterns as well because I am loving their creativity. They are amazing in their eye for details and their beautiful finishings. One of the best parts about Sofiona is that a portion of their earnings will be donated to A21 – a non-profit organization working towards eradicating human trafficking around the world. Isn't that great!? The first four patterns they have released are the Starry Night PJs, the Arctic Fox Housecoat, the Raven, and the Railway Joggers. You can purchase the Starry Night PJs and Arctic Fox Housecoat as a bundle for a further discount. All patterns are 30% off until November 25th. You can join the Facebook fan group to keep up with Sofiona's upcoming releases and to show off your creations is here. Also, there is a giveaway starting now on Instagram that will be open for 24 hours! 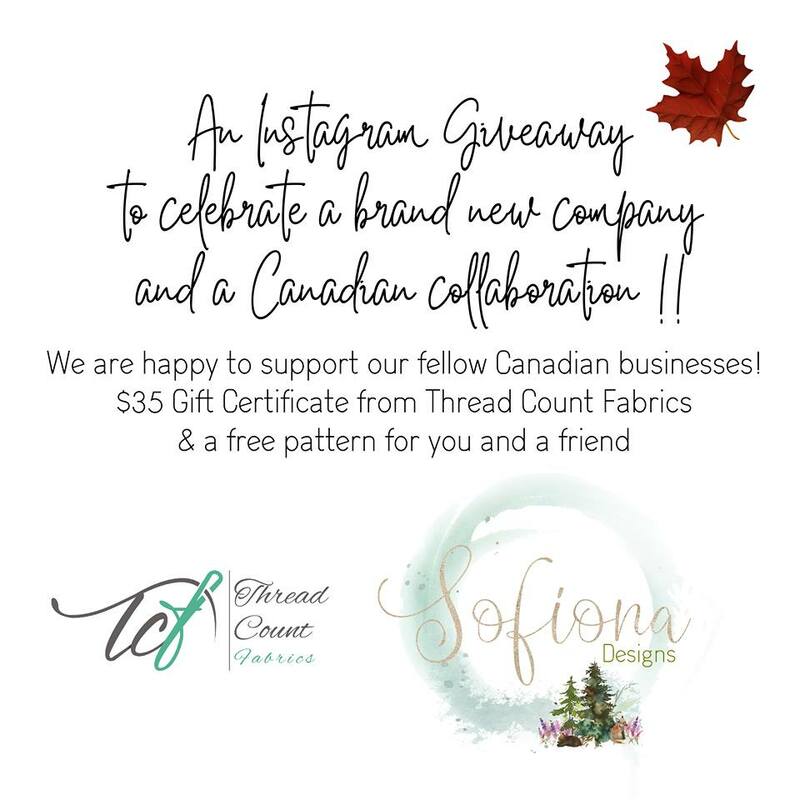 To be eligible, you must follow both the Sofiona Designs IG account and the Thread Count Fabrics IG account. Tag a friend in the comments on the Sofiona IG post. The winner will get a pattern for themselves and the friend that they tagged. Thanks for reading!! You may follow me on Instagram or receive updates by liking my page on Facebook. If you want to take a look into the things that inspire me, you can follow me on Pinterest. You may also follow my blog with Bloglovin. Disclosures: I received the patterns for free as part of testing so that I could give the designer feedback to make the pattern perfect for you. This post does not contain affiliate links! I am always so happy to hear that the girls love wearing their makes. Thanks for the tips and notes on fabric choice as well! Super important for those that may be new to sewing with this type of fabric. Both of these look great! I might be making housecoats for Christmas if I can find fabric I like. Thanks for the tips!